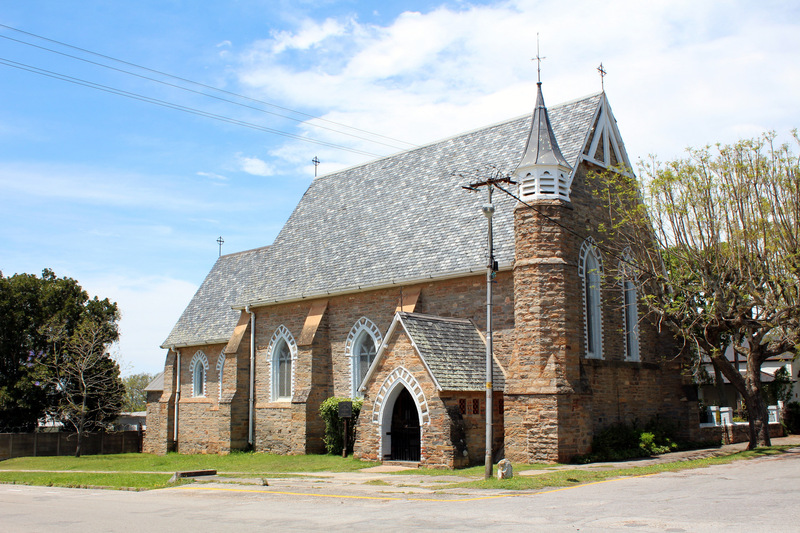 The Anglican church in Market Street, Grahamstown is St Batholomew's commonly known as St Barts; it is a lovely old church with an interesting history. ..
Holy Eucharist (with hymns) is celebrated each Sunday at 09.00, An Anglican Prayer Book 1989 is used. The Revd Eric Kelly, telephone 0466 224 552 or 0722 138 777, email ekelly@telkomsa.net conducts worship services weekly. St Bart's stands on the Market Street side of Artificers' Square, the location of a group of 1820 Settler cottages. Even within the settler community there were class divisions and snobbery. The colonial elite (which included the military) attended the Cathedral which was considered "High Church." Artisans attended St Bartholomew's, the "Low Church", on the corner of St Bartholomew and Market Streets. St Barts (as it is affectionately known) comprised two schools, two rectories and two poor houses, the latter (according to the deed of grant) reserved "for ladies of decayed circumstances". The Revd Dr Nancy Charton who used to care for St Bart's was the first South African Anglican woman to be made deacon and the first of the three women ordained as priests in 1992. The church's first rector was Nathaniel James Merriman, who was also archdeacon of Grahamstown and later became bishop of the diocese. Nathaniel Merriman was father of John Xavier Merriman, last prime minister of the Cape (1908-10). In 1850 he walked to Bloemfontein, and in 1851 to Cape Town to attend synod, comfortably shod in boots he made himself. The church's cornerstone was laid on 24 August 1857 - the Feast of St Bartholomew. Soldiers supervised by Merriman and the Anglican Colonial Chaplain, the Revd John Heavyside, built the nave and chancel to the design of William White. The church was consecrated on 24 June 1860 - the Feast of St John the Baptist. Situated above Artificers' Square (the tradesmen's centre) on Settlers' Hill (the residential area) St Bartholomew's Church was built by soldiers under the direction of Rev. Heavyside, the Colonial Chaplain, and Archdeacon Merriman. The Glebe Cottage is in Hill Street but a new rectory was built in 1985. The original girls' school is now the Parish Hall where tea was served to us. The original boys' grammar school now houses an active pre-primary school. Nathaniel Merriman who was the founder and first rector of St Bart's came to the Cape in 1848 after attending Winchester College (where he was head boy) and Oxford University, and spending a period as a curate in Lancashire. His wife Julia (born Potter). was a prolific letter writer. One of the legacies of Merriman's time is the practice of ringing the church bell five minutes before the beginning of the service. This was to signal that seats could be taken anywhere and was intended to undermine the earlier practice of paying pew rents. O'Meara, E., and D.G. Greaves. Grahamstown Reflected. Grahamstown:Albany Museum, 1995. Demissie, Fassil (2012). Colonial Architecture and Urbanism in Africa: Intertwined and Contested Histories. Ashgate. ISBN 978-0-7546-7512-9. p. 257.